MAUNA LOA, HAWAII (HawaiiNewsNow) - University of Hawaii researcher Norbert Schörghofer was studying permafrost on Mauna Kea when he heard about it: An ice cave on Mauna Loa. For the planetary scientist, it was too big an opportunity to pass up. If he could study it, he might be able to find important clues about Hawaii's climate hundreds of years ago, hidden in the cave's permanent ice. Schörghofer and his team of researchers started talking to people – residents, other scientists – about the ice cave, and they were able to pinpoint its location several thousand feet shy of Mauna Loa's summit. They first visited the ice cave in 2011, and made several return visits through last year. At the same time, Schörghofer and his team set to work figuring out what the literature said about the ice cave. That's when they hit a wall. They could find next to nothing in the research about it. No previous studies. No analyses. No baseline data. They finally stumbled across a lead: A 1978 article published in the "Limestone Ledger." The piece included a meticulous map of the 656-foot-long cave, and vital information about where permanent ice was found. But after reading the piece, they quickly noticed something: The 1978 survey, which included photos, showed a contiguous, walkable ice floor (known as the "skating rink") and large ice blocks. The team's new survey of the cave showed far less permanent ice. Writing in the journal "Arctic, Antarctic, and Alpine Research," Schörghofer and his team said the "skating rink" was gone by the time they conducted their multi-year analysis. All of the former known ice blocks had melted away, too. And ice patches on the wall are now seasonal, rather than year-round. In short, Schörghofer and his team found that in three decades, much of the ice in the ice cave had disappeared. In their journal article on the ice cave, which was published online this month and is set to appear in the February print issue, Schörghofer and his team said there are likely several reasons for the disappearing ice, including drought on Hawaii Island and global climate change. "Climate warming is the most persistent of these trends, and the most likely," Schörghofer added, in a recent interview. Permanent ice in ice caves is a treasure trove for planetary researchers. It contains well-conserved air and sediments that can provide important information about past environmental conditions. The permanent ice in the Mauna Loa ice cave is even more important because it's so rare in the islands. 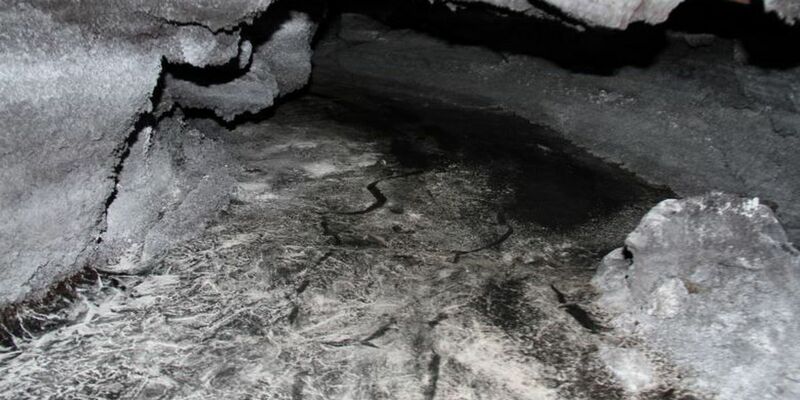 Ice can be found in other lava tubes on Mauna Loa, but it comes and goes with the seasons. Schörghofer said there's believed to be one other ice cave on Mauna Loa, but it's unclear how much permanent ice it actually has. The permanent ice in the Mauna Loa ice cave is layered, Schörghofer said, which means "it should have a record of the past in it." To study that past, Schörghofer and his team, made of researchers in Germany and Hilo, will need more funding. They hope to find the money to continue their research before any more of the ice in the cave disappears.